Movies were being discussed and let me tell you that these guys know what a good story is, they love good stories, and especially those that carry the message of Redemption. They said I should watch Blood Diamond. So we did. It was not an easy movie to watch because it is definitely "gritty, gruesome, brutal, and cold." But I kept on watching while my son would say, "Mom, you just have to wait." And one of the other young men, a good friend, insisted, "The scene, the powerful scene that encompasses the gospel message is coming." 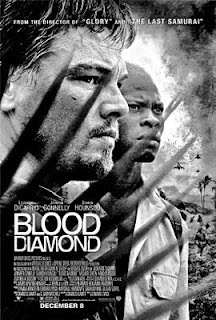 You can read a more extensive review of Blood Diamond at The Film Dissectors (know that you'll find some spoilers though). Grateful for the Father's love.